Despite rising globalisation after WWII, corporate R&D spending remained highly concentrated in the same small group of advanced industrial countries that dominated it for decades – until recently. Since the 1990s, the distribution of US multinational R&D investment across countries and industries has shifted dramatically toward non-traditional R&D destinations like China, India, and Israel (Kerr and Kerr 2018). Today’s leading US multinationals have developed a global innovation system that increasingly relies on emerging market talent to propel innovation for the global frontier. Why these emerging markets – and why now? In new research, we argue that the rising importance of software and information technology as drivers of innovation and new product development across a wide range of industries led to a shortage in software/IT-related human capital within the US (Branstetter et al. 2018a). This has driven US multinationals abroad in a search for talent. the differences in the type of activity done there. 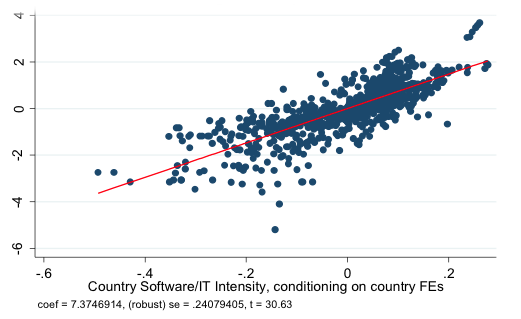 We also document that IT-intensive and software-intensive firms were more likely to conduct R&D abroad, and that foreign R&D is most pronounced in IT-intensive and software-intensive countries. Software and IT patents have been growing in importance since the 1990s; Figure 1 shows the share of all USPTO patents that are based on software. The share grew from 5% in 1990 to nearly 40% by 2015, and from 10% to 45% for IT. This growth in the IT intensity of invention was explored by Arora et al. (2013) and Branstetter et al. (2018b), who interpret the rise in IT intensity as the emergence of a 'general purpose technology' in new production development that applies across manufacturing industries. According to the National Survey of College Graduates, the IT/software workforce – made up of programmers, computer scientists, and electrical engineers – grew by 112% between 1993 and 2010, while the overall workforce grew by 70%. The foreign share of IT workers grew from 16% in 1993 to 32% by 2010. This phenomenon has been documented by Bound et al. (2015). These changes suggest an extremely large increase in demand that was partially met by importing talent from abroad, through mechanisms like the H-1B programme. raw engineering talent of high quality is available in large quantity and at relatively low prices in emerging markets – especially India and China. Interviews with the R&D managers of leading US multinationals both inside and outside the US supported the perception that there is a global shortage of IT and software talent. We also confirmed the need to move abroad to gain necessary access to large foreign supplies of skilled engineers. 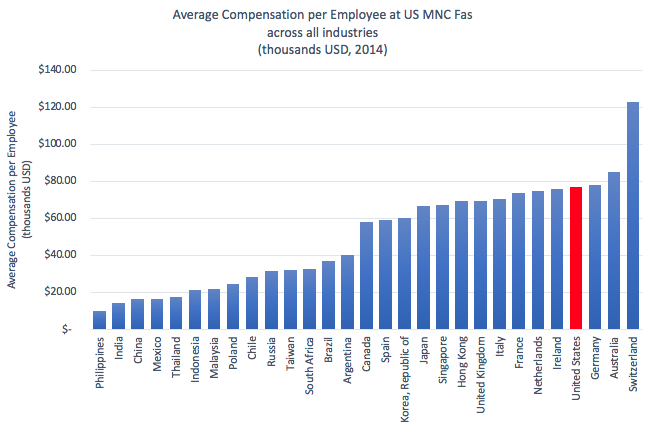 The supply of technically skilled workers is abundant in many of the same countries in which we found an increase in US MNC foreign R&D activity – notably India and China. Applications for Indian and Chinese high-skilled workers made up 85% of H-1B visa applications in 2017 (US Department of Homeland Security 2016), and Indian and Chinese students combined made up 18% of doctorates in science and engineering from US universities in 2016.3 This share was even larger in some key disciplines. If we view the large number of Indian and Chinese students pursuing graduate education at American research universities as the extreme right tail of a distribution of science and engineering talent, most of which remained at home, then this suggests a massive amount of software- and IT-trained human capital available in China and India. Indeed, Arora and Gambardella (2005a and 2005b) record an abundant supply of engineering and technology graduates in emerging economies. The types of activity done in new R&D destinations like China, India, and Israel suggests why they have been chosen as R&D hubs. Bureau of Economic Analysis data shows that R&D-performing affiliates in China, India, and Israel are concentrated in computer and electronic production manufacturing and professional, scientific, and technical services. In more traditional destinations like Germany, Japan, Canada, the UK, and France, R&D is concentrated in traditional manufacturing. 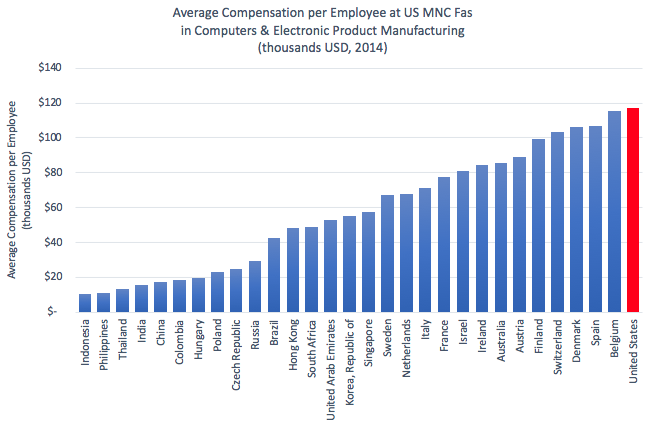 This suggests the need for human capital to meet the demand of software- and IT-intensive US multinationals has motivated US MNC decisions to do R&D in these locations. Figure 3 shows that patenting and the R&D investment of US multinationals outside the US has grown disproportionately in those regions where IT and software skills are well developed. 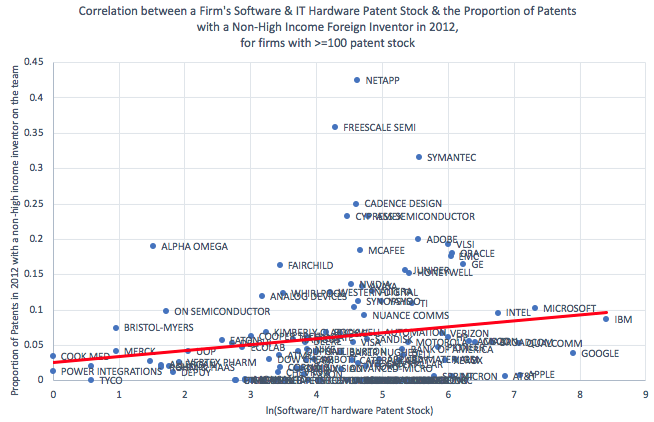 In the two graphs, the horizontal axis measures the degree to which local inventors in a country tend to specialise in IT and software invention, as measured by their USPTO patent grants. This obviously tends to be places in which local IT and software skills are well developed. Regression analysis also implies this positive relationship, which is robust to the inclusion of control variables. Global flows of investment, people, and ideas can help relax these constraints through open immigration policies and liberal trade and FDI policies. When successful, these flows raise growth, productivity, and consumption possibilities around the world. When US multinationals are able to import talent or export R&D work to the regions in which talent resides, this reinforces US technological leadership. Conversely, politically engineered constraints on this response clearly undermines the competitiveness of US-based firms. Since the early 2000s, however, the US labour market has become more closed to immigration. Caps on high-skilled visas like the H-1B visa programme have grown more restrictive, and evidence from Glennon (2018) shows that these restrictive high-skilled immigration caps drove US MNCs to shift some high-skilled activity abroad in an effort to address these constraints. Relatively liberal trade and FDI policies have allowed MNCs to address their human resource constraints by sourcing from abroad, but an open immigration regime for highly skilled workers would further ease this constraint. Finally, in addition to open immigration and liberal trade and FDI policies, the constraint on the supply of IT and software human capital in the US could be addressed with education policies that expand the supply of domestic IT and software human capital. Authors' note: We gratefully acknowledge financial support from the National Science Foundation through two grants: 1360165 and 1360170. The statistical analysis of firm-level data on US multinational companies was conducted at the Bureau of Economic Analysis (BEA), United States Department of Commerce under arrangements that maintain legal confidentiality requirements. The views expressed do not reflect official positions of the US Department of Commerce or the NSF. 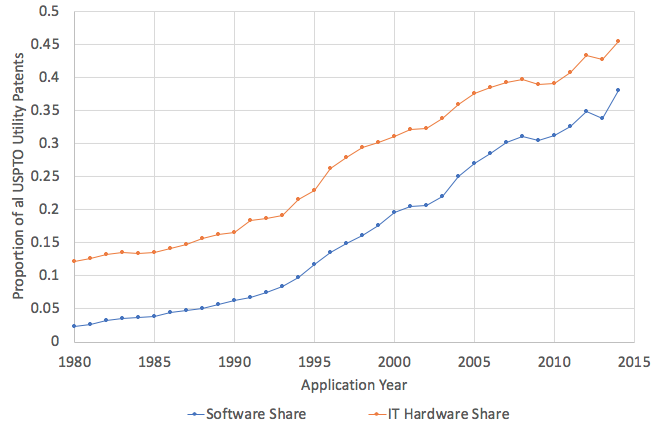 Arora, A, L G Branstetter, and M Drev (2013), “Going Soft: How the Rise of Software-Based Innovation Led to the Decline of Japan’s IT Industry and the Resurgence of Silicon Valley”, Review of Economics and Statistics 95(3): 757–75. Arora, A and A Gambardella, eds (2005a), From Underdogs to Tigers: The Rise and Growth of the Software Industry in Brazil, China, India, Ireland, and Israel, Oxford University Press. Arora, A and A Gambardella (2005b), “The Globalization of the Software Industry: Perspectives and Opportunities for Developed and Developing Countries”, Innovation Policy and the Economy 5: 1–32. Bloom, N, C Jones, J Van Reenen, and M Webb (2018), "Are Ideas Getting Harder to Find? ", working paper, Stanford. Bound, J, B Braga, J M Golden, and G Khanna (2015), “Recruitment of Foreigners in the Market for Computer Scientists in the United States”, Journal of Labor Economics 33(S1): S187–223. Branstetter, L, B Glennon, and J B Jensen (2018a), “The IT Revolution and the Globalization of R&D”, in Innovation Policy and the Economy, Volume 19, edited by J Lerner and S Stern, University of Chicago Press. Branstetter, L, M Drev, and N Kwon (2018b), “Get With the Program: Software-Driven Innovation in Traditional Manufacturing,” Management Science. Glennon, B (2018),How Do Restrictions on High-Skilled Immigration Affect MNC Foreign Affiliate Activity?, working paper. Jones, B (2009), "The Burden of Knowledge and the Death of the Renaissance Man: Is Innovation Getting Harder?" Review of Economic Studies 76(1): 283–317. Kerr, S P and W R Kerr (2018), “Global Collaborative Patents”, The Economic Journal 128(612). US Department of Homeland Security (2016), "Characteristics of H-1B Specialty Occupation Workers", Fiscal Year 2016 Annual Report to Congress. Arora et al. (2013) presented evidence that superior access to software engineering human resources enabled US IT firms to out-innovate their Japanese rivals in the 1990s and 2000s. Branstetter et al. (2018b) found evidence that firms better positioned to exploit technological opportunities realise higher returns to their R&D investments. Classified using the industry of the foreign affiliate. National Science Foundation, National Center for Science and Engineering Statistics, Survey of Earned Doctorates. This is consistent with research by Jones (2009) and Bloom et al. (2018), documenting the rising human resource requirements of innovation. Arora et al. (2013) argue that Japanese firms were constrained in their ability to respond to this shift, as a result of their rigid and closed-off labour market, and that part of Silicon Valley’s evident resurgence vis-à-vis their Japanese competitors was based on American firms’ greater access to immigrant talent.